I have a dirty little secret…literally. And I’m going to tell you about it. Don’t judge. Our staircase curves as you walk up it and on the left you pass by a ledge (or a niche if you want to get all fancy). I tried for years to find just the right piece to put there. It had a large basket for a little while, then an old window and some other vintage doo-dads. It had an urn with a plant that I couldn’t keep alive and then just the urn by itself. Nothing ever seemed to be right. And then, one day, I was at a local indoor market that is housed in the most adorable red barn. It’s filled with all kinds of goodness…fresh produce, baked goods, homemade doughnuts and fun decorative items. As I was wandering through the teeny-tiny aisles I spotted it. A big bucket. A REALLY big bucket. And I’m pretty sure I heard the hallelujah chorus over the speakers and a bright light shined down on it because in that moment I knew that I had finally found the perfect thing to put on our ledge/niche. I couldn’t wait to get it home and see if my suspicions were correct. And, sure enough, I loved it. I think the ledge/niche actually let out a sigh of relief because it knew I was finally done messing with it. A few days later I was going upstairs for what felt like the millionth time that day and was chagrined to see that there were some little chunks of dirt on the carpet I had just recently vacuumed. I picked them up and kept walking up the stairs and for some reason…call it laziness, call it an act of rebellion…as I passed the giant bucket I reached over and dropped the dirt right into it. Now, I could have walked back downstairs and thrown the dirt in the trash. Or I could have kept it in my hand as I continued up the stairs and thrown it in the trash in the bathroom. I could have even gotten the dust buster and sucked it right up. I took the shortcut. And I didn’t just do it once. I’ve gotten into the habit of doing this every time I find a rogue piece of bark or dirt or lint or whatever else I find stuck in the carpet. Especially if it’s only recently after I’ve vacuumed the stairs and I’m super annoyed that someone tracked in MORE stuff. For whatever reason, it just seems easier to drop them into the big bucket. The truth is that I don’t really want to be bothered with the added step of properly disposing of the dirt. Now, let’s face it, it would take a REALLY long time to fill up that bucket with all of my carpet pickings. But the other day as I walked past and dropped something inside, I wondered what it would be like if it was filled to overflowing and suddenly every piece of dirt and lint and string and piece of bark was visible to everyone. My dirty little secret would be a secret no more and I would be forced to finally throw it all away in an actual trash can. I think that in many ways my sin is like those pieces of dirt I find in my carpet. Upon discovering it I’m given two options. Dispose of it correctly by confessing it to my Heavenly Father and receiving the cleansing of forgiveness or ignore it…hide it…let it pile up in the corners of my soul and pretend it’s not there until it begins to overflow and can no longer remain hidden. Sin isn’t a popular word these days even sometimes among the Christian community. Conferences and books and (ahem) blog posts are filled with comfortable platitudes that feel much nicer, much gentler than a conversation about sin. Lately it seems like we’ve reduced faith to sound bites. And if those sound bites can be tweeted? Bonus points! But, here’s the thing.. I don’t want a sound bite faith. And for the sake of full disclosure, let me just say that I know I’ve fallen into this trap at times with my own writing. As an author in today’s climate, the pressure is always there to come up with just the right catch-phrase or the most quotable quote. Lately this has been weighing heavily on me. Because I too have begun to rely on those quick little nuggets that come across my social media feed to give me a spiritual boost only to wonder later why my soul is restless, why it longs for more. I’m drawn to the words that make me feel good. The ones that tell me that God sees me as beautiful and wonderful and special. And I’m not saying that these words aren’t true. But they are only part of the truth. Because the full truth is more complex, it’s more layered and before I can get to the place where I embrace how beautiful and wonderful and special I am in God’s eyes, I have to recognize my need for Jesus. And after I recognize my need for Him, I have to acknowledge that my sinful nature creates a chasm that only He is able to bridge. Then, and only then, can I fully understand the depths of His love for me. Then, and only then, can I see myself as HE sees me. Because then those words aren’t just pat-on-the-head platitudes. You see friends, a sound bite faith is a shortcut. And just like my attempts to take the shortcut with the dirt on my stairs, this type of faith can prevent me from properly dealing with my heart issues…with my sin. Milk faith is gentle and non-threatening (unless you are lactose intolerant…but I digress). Trying to sustain our faith on just milk alone won’t work. Because once we recognize our need for Christ our appetite for deeper relationship with Him should increase. And milk will never be satisfying enough. We need meat. We need something we can actually sink our teeth into. So I’m choosing to put the sound bites in their proper place. To remember that they only really scratch the surface of what it means to experience deep, meaningful faith. I’m choosing to not let them be enough. And I’m doing something dangerous. I’m asking God to continue to reveal to me the sin in my life and to give me the courage to properly deal with it, not to simply brush it aside and hope that once out of sight it will also be out of mind. Because once I’ve addressed the sin, there is room made for my faith to go even deeper, even more meaty. I don’t want a sound bite faith. I want the whole story. Now, if you’ll excuse me…I have a bucket to go clean out. 21 Comments on "A Sound Bite Faith"
I pray every day. 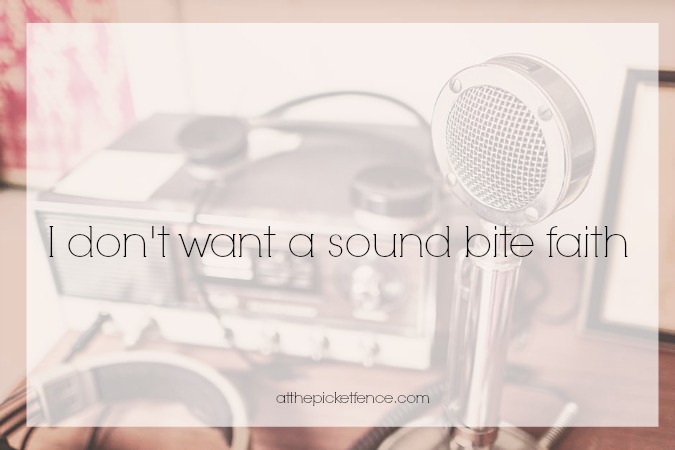 I never want a sound bite life! God has to forgive me everyday. Great post! I totally agree with you, and the struggle is real. To have that catchy phrase or quote or post. But yes, we must go deep with God. You did a wonderful job with this, it is so true we fall into the habit of just coasting along. We pray, go to Church on Sunday but most of us don’t dig down deep inside our selfs to really practice strong faith on a daily routine. Thanks for your inspiration. This refreshed me right to the very core….thank you for sharing!! Thank you for taking the risk to share your faith! In this day and age, that isn’t very popular! You are here for a purpose, thanks for sharing it! Wonderful post! You nailed it! I needed to hear this today! Thanks! Vanessa, in this day of extolling the importance of having & fulfiling a so-called “bucket list”, you put into perspective an actual need in our lives. Thanks! Thanks Vanessa for sharing this story. I can really related to it. I work up early and was talking to the Lord this morning and I laid in bed. I realized that I get so busy that I don’t take as much time as I need with the Lord nearly as often as I should just to be still in His presence and praise Him for who He is. I talk to Him throughout the day but so often I feel rushed in spending time with Him due to obligations. Vanessa, I love how you share your faith. I admire you for doing this because so many people are looking for peace in this world of turmoil — peace that knowing only God can give. You are such a blessing! I always look forward to your posts. You sure have a way of capturing our imaginations and luring us in – well done. This is fabulous writing! HUGS! Yes. I’m with you. Thanks for sharing. Sometimes those buckets get larger, too, and I’m with you on emptying it and refilling with things that bring joy to not just me, but Him. Ouch, but I’m with you. I want a deeper faith as well. This was good-thank you. Thank you Vanessa. I needed to hear this today. This is so good. I agree completely! Thanks for sharing your heart here. Dangerous prayer, indeed. But necessary. We have to ask God to reveal our sin, because our hearts deceive us and we cannot understand on our own (Jeremiah 17:9). Thank you for being an instrument to convict my heart. I’m new to your blog and didn’t realize I’d get great theology as well as decorating advice here! I’ve added you to my Feedly list to read every day. Looking forward to more spiritual encouragement! Such a great post! I appreciate your hunger for a deeply rooted faith and your faithfulness to truth. This is just what I needed to hear today. Thank you Vanessa. Thank you. This is so insightful. Thank you for being so transparent. It’s amazing to see what God allows us to see in our everyday lives. I must confess daily so I don’t grow weary and so my bucket doesn’t overflow. Beautiful article Vanessa.